Brands hardly miss opportunities to make money, as evidenced by things like home-decor collections draped in logos of luxury carmakers with astronomical price tags. Brands do, however, often miss the opportunity to bring forth true social change with those cheap money grabs—like, for example, making race-car beds (or just car beds) socially acceptable after the age of 12. Bugatti announced a new home collection Tuesday, with chairs, couches, desks, tables and a “Bugatti Home Chiron bed.” This kind of collection is normal, since brands love to use their logo to sell other random items that have little to do with what people generally associate with said logo. From home decor to fashion lines, $30,000 books, luggage sets and even strollers, people love paying to be walking advertisements, and brands love to forge loose connections between things like end tables and supercars. The “Chiron Dormeuse” from Bugatti’s new furniture collection. 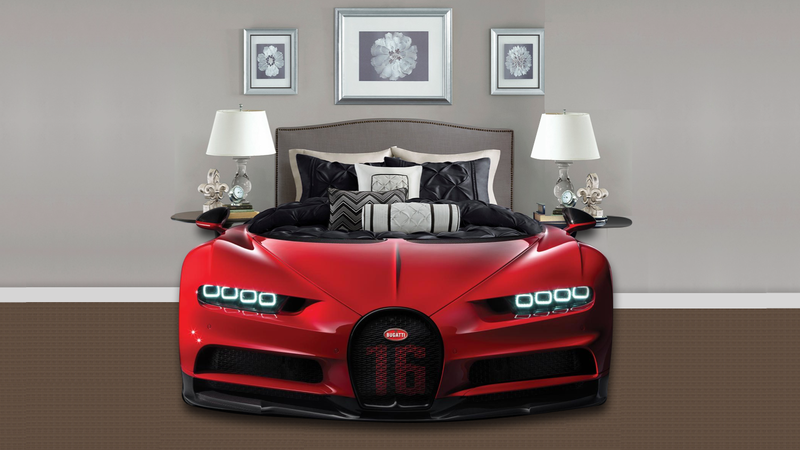 Bugatti didn’t post photos of the bed in the announcement, but its past ideas for beds have been, well, beds. Regardless, the whole thing was a reminder of how much of a missed opportunity these brand furniture lines are. A photo of Bugatti’s furniture line released in 2016, with the “Lydia bed” in the back. Luxury car companies are great at putting their logos on stuff that looks expensive, like ultra-modern chairs, couches and tables that’ll be out of style in a few years—just in time for their ultra-rich owners to bring in a new load of furniture, anyway. But that’s lame, expected, and we’ve all seen it done a million times. What supercar makers should champion, instead, are car beds. Not beds with little meaningful inscriptions carved into their fancy wooden structure, or with strips of carbon fiber as their trim. Luxury carmakers should stick the nose of a car on the front of their silly branded beds, thus finally making race-car beds acceptable—cool, even—past the age of 12. Designer car beds? Sure. Car beds accented with sheet metal from race cars? Do it. Beds with the grille of some old Jeep you found at the junkyard adhered to the front, rust removed and painted to match the decor? Absolutely. This could be a thing, if only someone, or some brand, would make it a thing. Brands love money grabs like clothing and accessories, whether those brands be for the common person or the unfathomably rich. But the latter could do all of us all a favor and make adult car beds a thing people associate with fanciness and wealth, because, really, it’s time.